As I was sweeping the house (a continual task in an old house made of limestone and occupied by a man intent on demolishing walls) I was surprised to see a bundle of dust wriggling its way across the floor. This "poor little fella" (© Rolf Harris) had managed to get his head completely entangled in a dust ball and wasn't at all happy, striking out at all and sundry. He almost managed to be scary - not a bad effort for a non-venomous snake only 10 inches long and as thick as my little finger. I used a broom to shoo him onto a shovel and trap him there while I carried him to the garden. Just as well I am a tough Aussie used to snakes. Note from Susan: For those of you interested in such things, the visitor is a juvenile Western Whip Snake Coluber viridiflavus (Couleuvre verte et jaune). 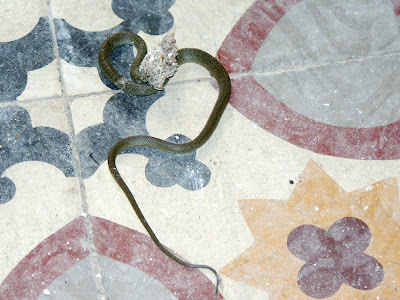 A photograph of an adult can be seen in my post about Snakes in France. 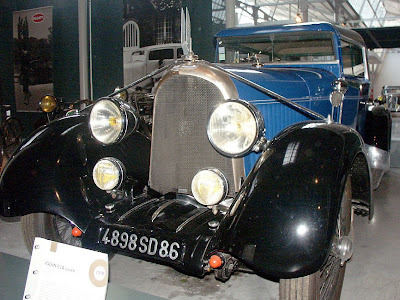 In May I went to the Musée Auto-Vélo in Chatellerault's old arms factory with Susan's parents. 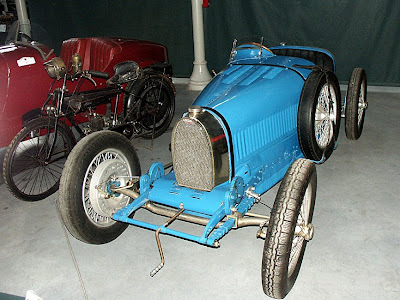 I was surprised (and not a little excited) to see they have some seriously good cars in there, a brace of Bugattis included. I am not a car expert by any stretch of the imagination, but I do appreciate beauty - and some of these cars are beautiful. OK - I accept that the Zeppelin is a hefty brute, and not exactly beautiful, but it does have a hydraulic jack on each wheel and a clutchless gearbox. It is huge - just the sort of car you need for running peasants off the road - and it looks the part! 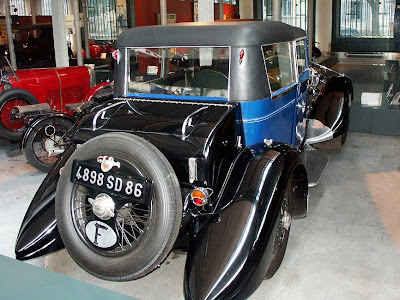 1929 Voisin C14 coach - just how stylish is that? 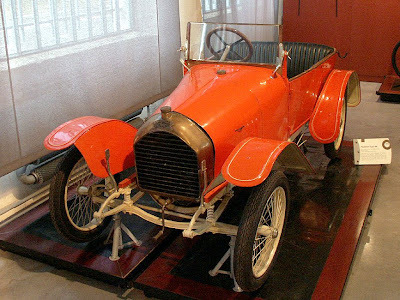 A Peugeot, possibly type 58 (or not - according to what I can find on the interwebby thing, the type 58 was a pre WWI car of a really old pattern) There are very few (ie almost no) resources on the Musée Auto-Vélo on the net, which is a pity. 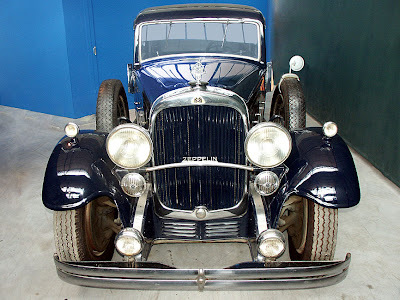 I can't find a list of the cars they have, nor, apparently, have any car enthusiasts ever visited the museum with a camera. Even the publicity literature they produce to hide in the main tourist office doesn't present it in a terribly enticing light. 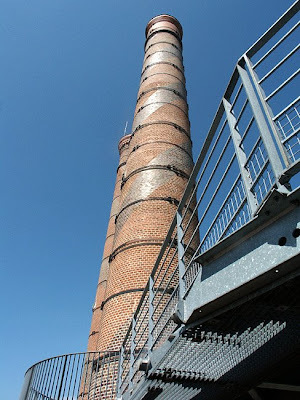 The day we went there we were the only people visiting, and my main reason for visiting was to see the walkway between the chimneys - the museum was a bonus. While I am back in London, I have had a mate from Australia staying. Adrian used to live next door to my parents in Australia. 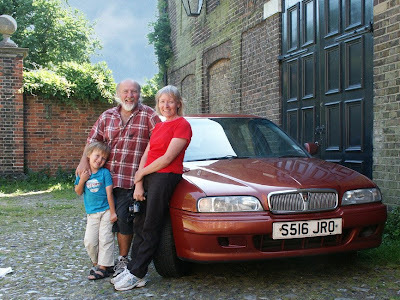 He is on his "trip of a lifetime" (probably the third such trip he has made) and has been looking for a car to tow a caravan around Europe. As a bloke who knows blokey stuff, I have felt the need to be involved. Mainly because I know the lie of the land and he is a visitor, because Adrian is good with cars. He has needed to be. We have seen plenty of rust buckets and met some Arthur Daley types (many of whom it would be advisable to count your fingers after shaking hands with). On Wednesday we did over 600km chasing around these "characters", not something you would want to do too often, but at last he has his car. 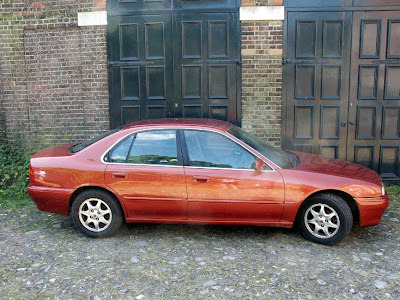 It is a big old lump of a rover, a turbo diesel for economy, with nice comfortable seats and a towbar. Now he will be able tow his caravan to Preuilly to help me shift the bath. So: we have now demolished the bathroom wall on my way to replacing the bathroom floor. The staircase (lower level, anyway) has also gone. Almost 6' long, made of cast iron and wedged into a space almost 6' long, removing the bath is going to be a real issue. It would be difficult enough moving the bath out of its current space even if I was confident about the state of the floor - but as I am rather hesitant about even treading on the floor (probably unnecessarily, but I like living) it has become the elephant in the room. First step will be to disconnect and then remove all the pipework and the hand basin. Next, I will have to remove all the tiles from the wall as the bath has been tiled in - and the tiles have to go anyway. After that, the bath will have to be slid sideways through the space where the wall used to be. This should be the easy (if slightly uneasy feeling - c.f. my comments regarding the state of the floor) part. 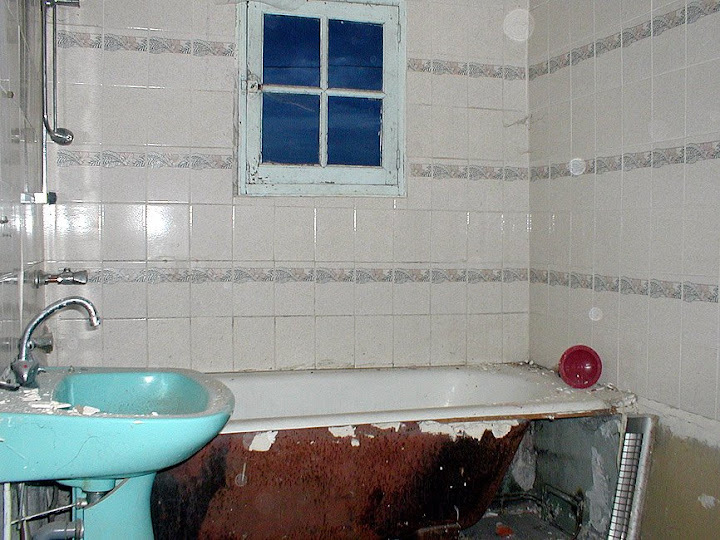 The real problems will start once the bath is on the landing next to where the staircase used to be. How do I get a very heavy 6' long bath down a hole that measures 5' x 3' that doesn't have stairs? There are no beams from which I could sling a rope, and no way of jury rigging a lifting arm. Consensus at the moment seems to be to break the bath (it's cast iron, a combination of drills saws and then a decent meaty whack with a big hammer should do it), but I don't like destroying anything that may come in handy in some form later. We have been to Richelieu many times. * Usually it rains in Richelieu when we are there, but even when it isn't raining I have never visited when the sky was anything but grey. This leads to dull photos. 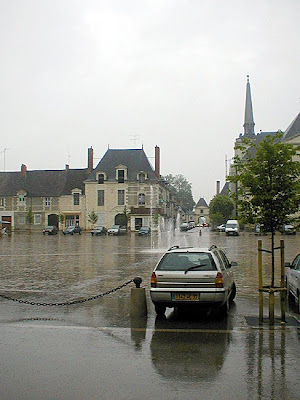 Last month when we visited with Susan's parents on way to a failed attempt to visit the gardens at Azay-le-Rideau, it again rained. Seriously heavily this time. This is a pity, because a lot of time, effort and money has been invested in Richelieu and it would be nice to see it looking pretty and sparkly. 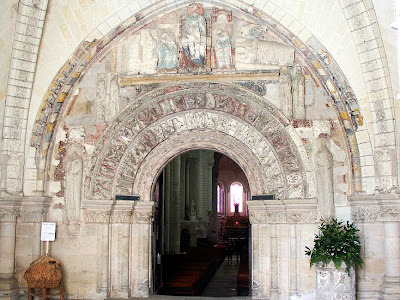 Imagine my delight, then, when on our way to Fontevraud a week later we passed through Richelieu and it was sunny. This gave me an opportunity to see the new works in one of the town squares looking at something approaching its best. The civic work includes paving and a fountain (NOT for running through, according to the signs). This isn't the only work being done in Richelieu, however. Many of the very bourgeois mansions are being sympathically restored by private owners. There is a lot of work happening all over Richelieu, but some of the houses look like glossy lifestyle magazine candidates already. 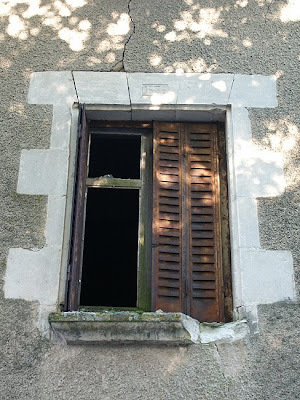 For people interested in Richelieu, the man and the town, visit Henri Proust's blog. 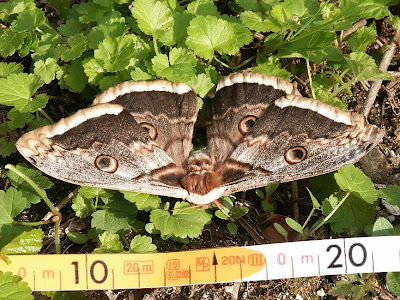 *for those who remember "Round the Horne", that's "many times, many many times..."
Allow me to introduce Europe's largest moth - the Giant Peacock Moth. This one was 15 cm from wingtip to wingtip. They can be seen from March to June and are often mistaken for bats. The caterpillars feed on Blackthorn, Ash and other trees. Here in Preuilly we are close to the northern limit of their range but they are fairly common. Females are bigger than males. This one is female, as can be seen by the fine string-like antennae. Males have very feathery antennae - all the better for picking up those irresistible female pheromones. They prefer open countryside and can be seen resting on tree trunks in orchards during the day. Giant Peacock Moth - well it's big and it's got false eyes like peacock feathers. Saturnia pyri - 'saturnia' refers to the winter solstice, but I do not know what the connection to this moth is - perhaps the pattern on the wings was thought to resemble a mid-winter sunrise. 'Pyri' = 'pear' - a reference to their pear-shaped cocoons. Le Grand paon de nuit - 'large night peacock'. Blackthorn - so named because they have needle-like thorns and the branches look black. Their fruit are called sloes, and can be used to make sloe gin. Prunus spinosa - 'prunus' = 'plum'; 'spinosa' = 'thorny'. Le Prunellier ou le Prunelier ou l'Epine noire ou le Buisson noir ou l'Epinette - crikey! How many vernacular names does one plant need?! 'Plumlike', 'black thorn', 'black shrub', 'thornlet'. Ash - a large and impressive European hardwood tree, used for furniture-making and prized as firewood, as it will burn well even when wet. 'But Ashwood wet and Ashwood dry, A King may warm his slippers by.' In the past it was used to make weapons (spears and bows) and 'ash' is a corruption of an Old English word for 'spear'. The other well-known rhyme associated with Ash refers to weather forecasting - 'Ash before Oak, in for a soak' - however recent analysis of phenological records indicate that there is not much evidence to support the idea that if the Ash comes into leaf before the Oak we are in for a wet summer, and even if there is, it seems we don't have too much to worry about. According to British phenological records Oak leafing dates are advancing at a far faster rate than Ash (although it is also clear that British Springs are far more variable than those on the Continent, both in terms of average temperature from year to year and in rate of the advance of average event dates.) Presumably the trigger for Ash leafing is less influenced by temperature than Oak's trigger. Fraxinus - the Latin for 'ash'. 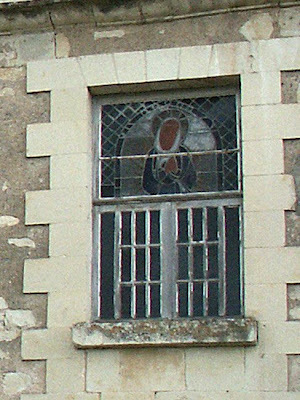 Le Frêne - from the Latin. Many "dolmen" are shown on the large scale Michelin and IGN maps, but these are not exhaustive. 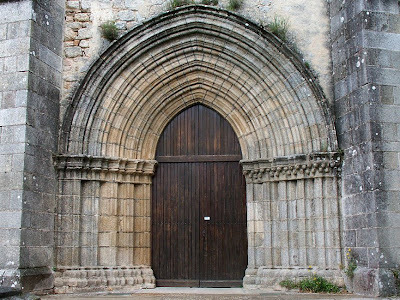 There is, however, a great website called the Megalithic Portal, which lists ancient sites from around the world. 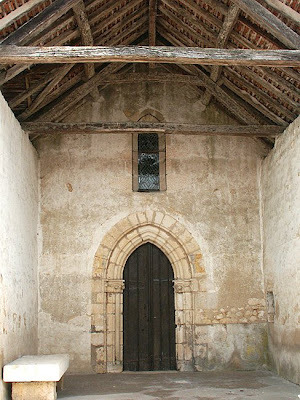 Included are 23 sites in Indre et Loire, mainly burial sites. This it "la Pierre Chaude" (the Hot Rock - sounds like a particularly naff 70's covers band to me, but I digress) near Paulmy. It isn't exactly unknown, or even unsignposted, but like many of these sites around the world, they don't exactly shout about it, either. I guess it is part of the conservation policy. It is (or was) regarded locally as a 'fairy seat'. Excavated in 19th c, it contained skeletons of Neolithic farmer-graziers who erected the monument in the 3-4 millennium BC. Grave goods were found, including pottery vases, stone and flint knives, animal bones. 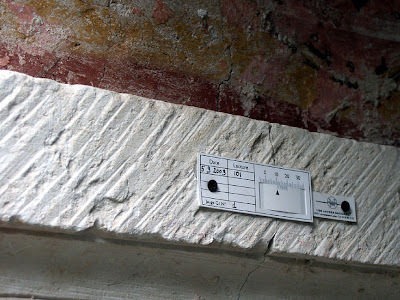 The original form of the chamber is well preserved with 5 uprights of 'grès' (sandstone) still in place to a height of nearly 2m. 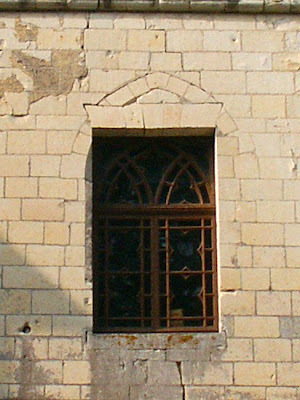 One of the stones has been deliberately broken to block the entrance. The opening is oriented to the east, towards the rising sun, and there may have been a passageway preceding this which has disappeared. A piece that has broken off the 'table' (the flat rock cover) is laying 2m to the north. 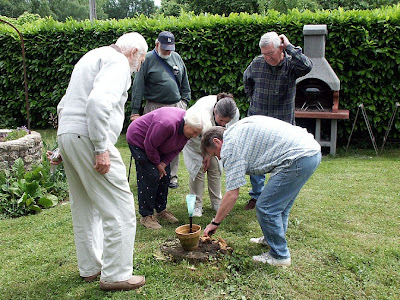 Some 200m to the south, the permanent spring of Fonteny, symbol of perpetual renewal, comes deep from the earth, surely an indication of why the grave was placed in the middle of a swamp in the Brignon Valley. 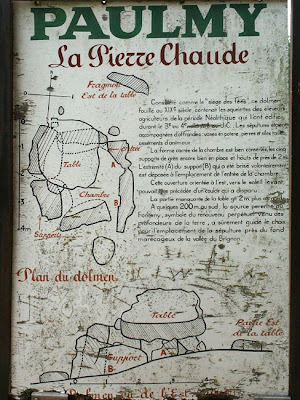 (Translation of the noticeboard at the site). 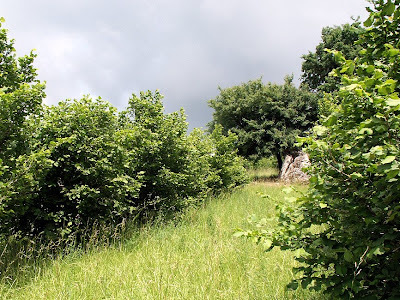 It is in the middle of a hazelnut grove, which sounds pretty witchy and ye olde majick (hazelnuts are one of the five sacred foods of ancient China, and also one of the 9 woods sacred to druids) but this hazelnut grove is a commercial orchard. 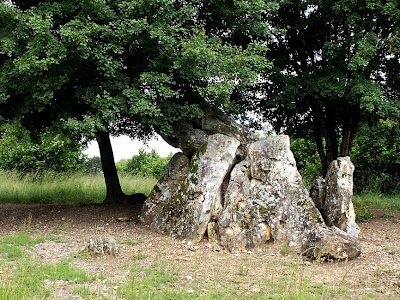 I don't know if I would drive a long way just to visit this or any of the other dolmen in our area, but it offers a good excuse to get out of the car and stand there looking contemplative if you're in the vicinity. Chatellerault is a surprising place. 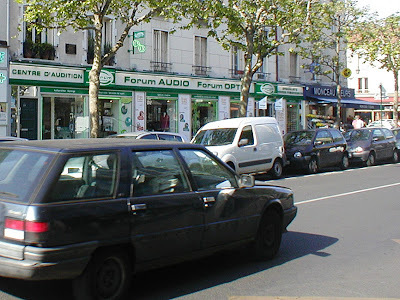 A smallish (population 34,000) town near the centre of France, until 1968 its main industry was the manufacturing of arms. Somewhere in here is a town. In 1816 the French Artillery Commission decided to create a new government arms factory in a safe place away from its borders. In 1819, a Commandant Notret, the last inspector of Manufacture de Versaille, started the production of tools (axes and spades), then increased production with the fabrication of swords. In 1822, the manufacture of firearms started. 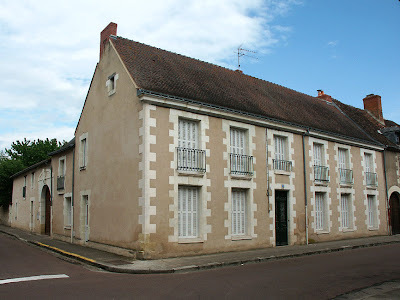 By 1837 it was one of two main firearms and sword manufacturing towns in France, the other being Saint-Etienne. When the factory closed in 1968, the small town was left with a huge empty industrial complex (and presumably very few jobs). 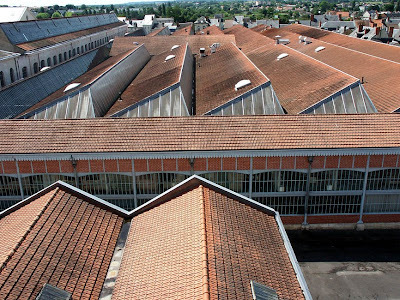 Part of the factory is now the French Military archives relating to armaments, with the rest of it being used for various social clubs, sports halls and the Ecole nationale de Cirque (National Circus school). 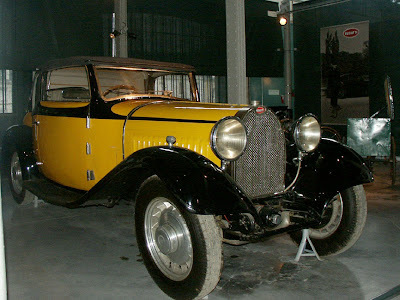 It also house the Musee Auto-Velo, which I visited with Susan's parents and will be writing about later. 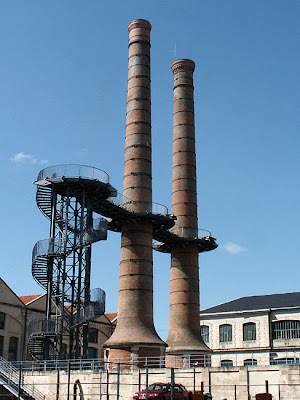 One of the outstanding parts of the factory are the chimneys which originally served the furnaces. The have been cleaned and a walkway installed between them, giving views over the town. 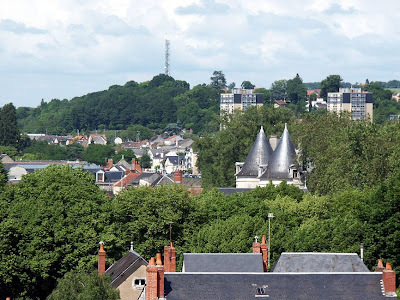 Although it is quite a slog to the top of the spiral staircase it is really worth it, because with the exception of the market square, from ground level Chatellerault isn't all that attractive. From the walkway you get a really different aspect. It also occurred to me while I was up there what good tradesmen the brickies must have been - those spirals aren't painted on, but laid in a different, darker brick. Duck down the side of the Abbey in Preuilly, and there are some very interesting architectural details to be seen. 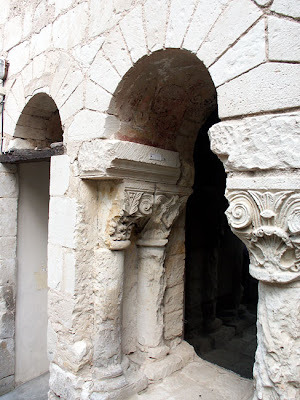 This weathered archway has a crack which must have caused enough concern to result in the application of a gauge to measure the movement. Happily, it appears that the crack has been stable - at least since 2003, anyway. For those interested after Thursday's post; EDF have actually refunded a fair portion of our payments for electricity. I guess now I will have to update our meter reading online after every trip to Preuilly. 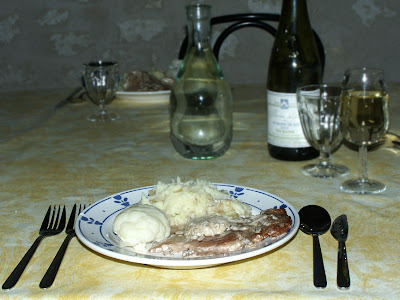 Recently I emailed Jean-Michel Chedozeau, the chef/proprietor of Restaurant de l'Image in Preuilly, to say that I had tried out his recipe for Brenne Carp Fillet with Ste Maure de Touraine Cheese and that we had found it delicious, but being in London at the time, did not have access to proper Brenne carp, and so had substituted another white fresh water fish (from Vietnam, but I forget the name). 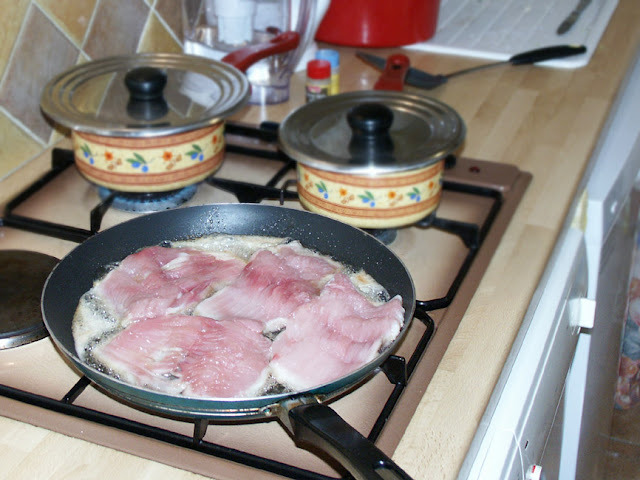 Thanks to C-H for pointing me to this recipe link which combines two regional specialities. Jean-Michel very generously offered to get me some carp from his supplier, and so one afternoon, in return for a jar of my Lemon Curd, I picked up a plastic box containing four pieces of carp from him at the restaurant. He explained that his supplier was experimenting with a new machine for filleting and boning the fish and asked that I report back as to how many bones we found left in the fillets. He was clearly dubious that the machine was doing a good enough job for him to risk serving fish dealt with in this way in the restaurant. His concerns are probably justified - one of our pieces had no bones, but one had about 15 little pieces of bone, and the other two had about 10. As his wife Martine said, this is fine for private, home consumption, but too much of a worry for the restaurant. The ingredients of this dish. The pieces of carp have a rather curious structure, as though they have been run through a meat tenderiser. Whilst my effort was tasty, it was nowhere near as glamourous looking as Jean-Mi's original. He obviously exercised cheffy attention to detail and kept his sauce nice and white. I quite happily allowed mine to take on some of the caramel colour of the cooked fish. 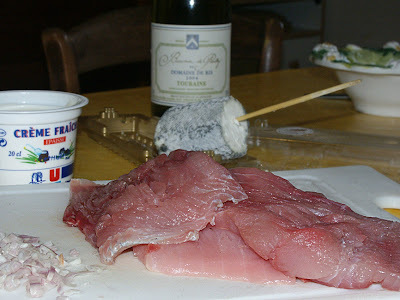 Carp is despised in Australia as not being fit for human consumption, but here in the Touraine du Sud and Berry, and in many other parts of Europe, it is extremely popular, and farmed on quite a large scale in the Brenne étangs. We have a soft spot for carp, as for many years we have had a ceramic carp hanging in our kitchen, a gift from a visiting Czech museum curator. She told me that the little carp is a good luck talisman, so we make sure we give it a pat from time to time and remind it that we need to sell our house in Australia. 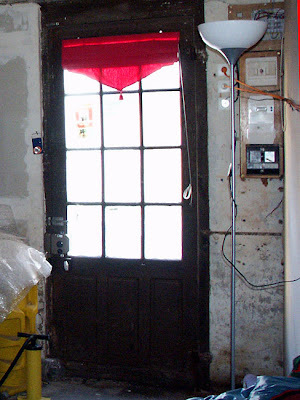 We had the electricity connected to our house in September 2007. This was an interesting process in which we managed to get exactly what we didn't want after a flurry of emails, phone calls and two visits by EDF operatives. Since then we have been charged for a lot of electricity. This is a problem, because until February we used no power at all, and since then we have used what the average family of 4 would use in a week. This means we are about 8 months in advance (and gaining) on our electricity bill. I have signed up to the EDF website to submit my meter readings, but the site just didn't believe me - apparently you can't submit a meter reading lower than the estimate already on the records. On Tuesday I finally managed to contact English speaking service of EDF with the right numbers (surprise surprise, I got straight through both times I rang!) and I am told we are going to get a reimbursement of the huge amounts of money we have already paid. 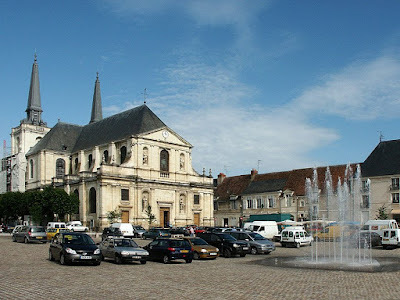 It takes 80 minutes to drive from Preuilly-sur-Claise to Tours, a distance of approximately 75km (about 45 miles). Driving this distance involves using about 4 litres of fuel each way (at €1.40 a litre) and then paying for parking. Imagine my delight at discovering that you can do this same trip by bus for €1.50. You can see by the map that the bus takes a slightly circuitous route - which is why the trip takes one hour and 55 minutes. There are three buses a day from Preuilly to Tours during school term (7.00 10.20 and 17.28), two a day during school holidays (10.20 and 17.28), and four a day on the return trip. 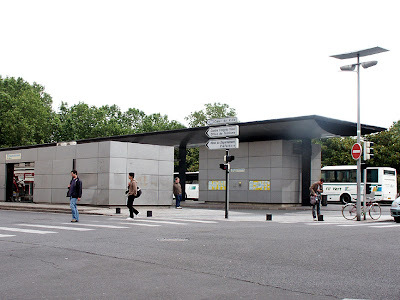 The bus station in Tours isn't attractive by any means, but is it in front of the striking Tours central rail station. 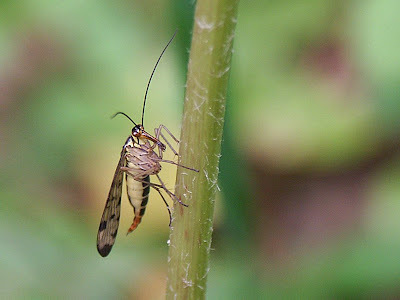 This weird creature is called a Scorpion Fly, but it is not a true fly. It has four wings, and true flies only have two. This one is female and heavily gravid (ie 'pregnant' - full of eggs). Which species of Scorpion Fly is very difficult to determine with females. They are creatures of shady places and that beak wiffles up dead animal matter and fruit, but they are completely harmless to humans. The photograph was taken just outside Bossay sur Claise. Scorpion Fly - so called because the males have what looks like a scorpion's sting at the end of their abdomen and hold it curled over their body the way scorpions do. They are completely harmless and this appendage is their genitalia. Panorpa - means something like 'all turned around', presumably a reference to the way the males hold themselves. See a picture here. La Mouche scorpion ou la Panorpe - 'mouche' = 'fly'. There are three Loire Valley bloggers in this photo. Can you identify them? And can you guess what they are doing? The well-known and ancient symbol of France, the fleur de lys, is a stylised version of the wild Yellow Iris or Yellow Flag. 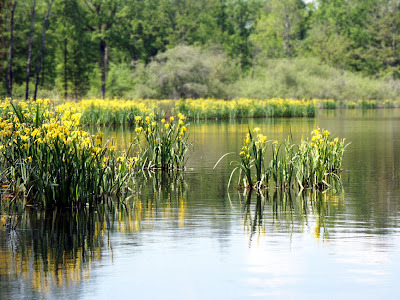 In French the plant is called l'iris des marais. 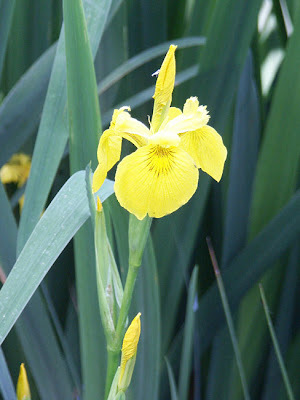 The scientific name is Iris pseudacorus. It may also be connected to another great French heraldic symbol, the Oriflamme - the 'golden flame', the Royal Standard carried at the head of the medieval French army. 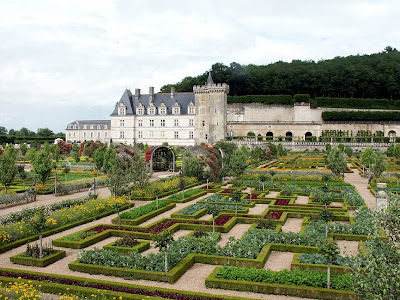 Villandry is considered a must see on the Loire Valley circuit, and one of the great gardens of the world. About an hour and a quarter from Preuilly sur Claise and situated at the confluence of the Cher and the Loire, Villandry, built in 1536, was one of the last Renaissance châteaux to be constructed. 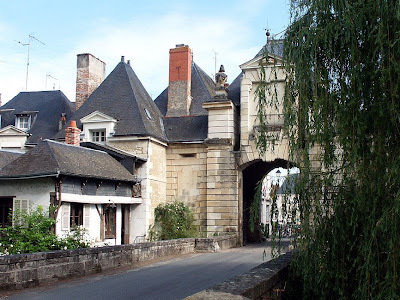 It is in the architectural style known as Henri IV, unlike its neighbour Azay-le-Rideau, which is in the Italianate style with remnant medieval bits. 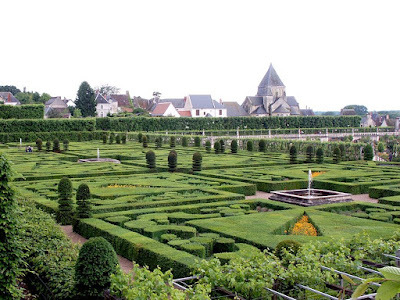 In the 18th century the garden was in the English style ie a park, but in 1906 the property was bought by a Spanish scientist, Dr Joachim Carvallo, who created the famous parterre garden we see today, and Villandry remains in the hands of his family. 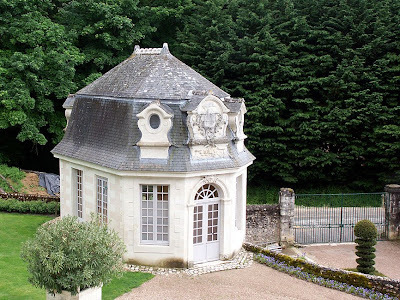 Carvallo saved the château from probable demolition and went on to found the Demeure Historique in 1924 (the equivalent of the Historic Houses Association in Britain). 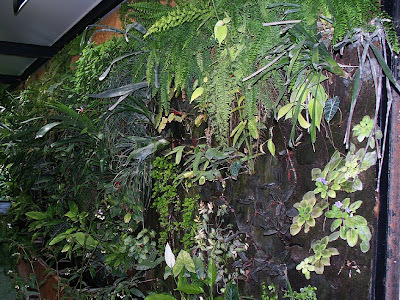 The gardens are on three levels. The ornamental garden, on the middle level is by the south façade of the château. This garden is created from a pattern of Box, divided into four squares, each representing an aspect of Love. An overview of the gardens, showing the Garden of Love in the foreground, with the Potager beyond to the right and the Music Garden to the left. But it is the potager which is the masterpiece. I thought the use of broad beans (the taller greyish plants in the zigzags) as a bedding plant was very creative. There is no denying that Villandry is a striking piece of work. 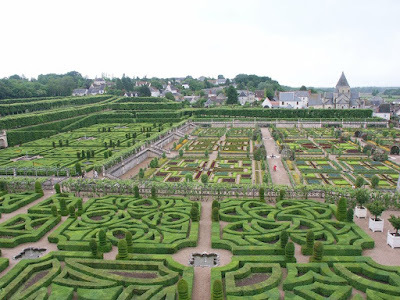 The parterres look like huge Oriental carpets made of plants and the effect is magnificent. 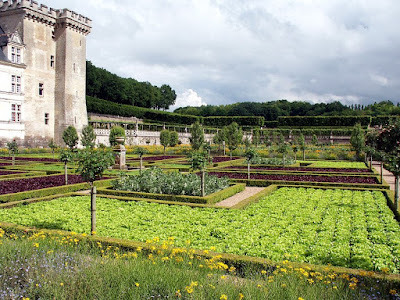 The most striking aspect though is the sense one gets of the sheer amount of labour and horticultural skill that goes into maintaining the hedging and pollards and the absolutely uniformly sized and coloured lettuce, cabbage, carrots, leeks, broad beans and beetroot, set like the enamel in cloisonné. Man hours and skill like this cost a great deal of money. I happened to read the entry in Routard regarding Villandry and was amused to see that the French version at any rate seems to be ever so slightly sniffy about Villandry. Routard is my friend at lunch and dinner time, but for some reason, I rarely consult the Guide regarding places to visit or accommodation. It's possible therefore that being condescending about visitor attractions is simply the house style. May is asparagus time in the Loire. Many places in the Loire have sandy soil, ideal for asparagus production. It is grown in the Sologne particularly, and we have a local grower who comes to the Preuilly market with asparagus, walnut oil and eggs. The regional favourite comes in thick white stalks. 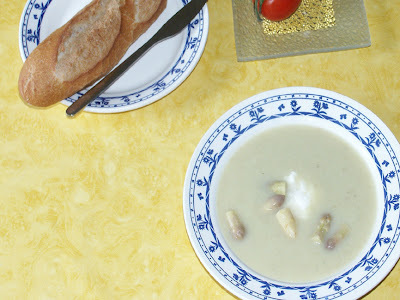 Personally I prefer the sweeter green varieties, but sometimes in the smaller markets one can only get white, so I decided to make asparagus soup. 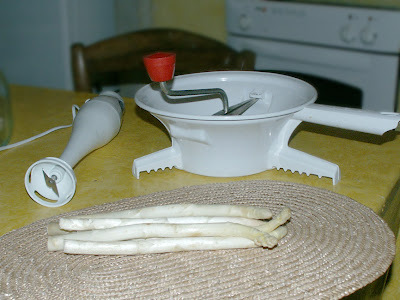 Unlike green asparagus, white asparagus must be peeled, as the skin is bitter. Apart from the skin, white asparagus has a much more delicate (dare I say - elusive!) flavour and is crisper and juicier than the green. With green asparagus, you hold the stem at each end and bend until it breaks. This nifty technique neatly snaps off the woody base at just the right point, without wasting any of the nice edible bit. The white stems are more brittle than the green, and snap very easily anywhere along their length, even when you are peeling them. 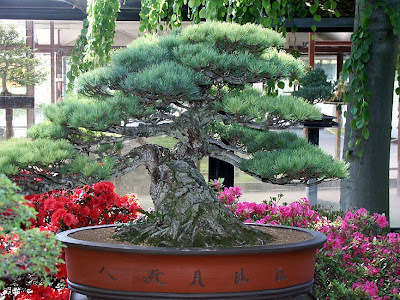 This may be one reason why the thicker stems are more popular, and as they don't tend to be woody like the green, just cutting off a centimeter or so of the base is fine to clean the stems up. 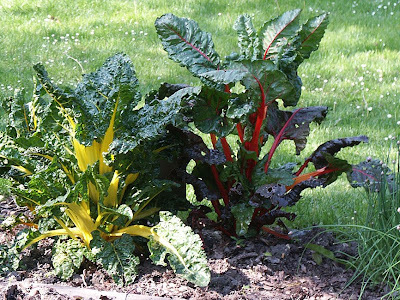 The pale colour is achieved by a growing technique known as 'blanching', where the growing stalks have soil mounded up over them so they do not develop cholorphyll, which would change the flavour. These days they are also covered in plastic, and we saw several lots being harvested in the pouring rain recently, a few metres of plastic being lifted at a time. It looked utterly miserable, but the 'window' for picking asparagus is very small - it grows incredibly fast, and leaving it a day could easily mean it goes from perfect to stringy. It must be eaten as soon as possible after picking, as the sugars convert to starch very quickly. Sometimes you see asparagus at the market marked as yesterday's. It will be going cheap, but I am not convinced that it is value for money. Asparagus also grows wild in the Loire (it is native to much of Europe), and this hedgerow species is considered a very great delicacy. I have seen it near Preuilly, but not in enough quantity to try a dish of it. We do get Spiked Star of Bethlehem Ornithogalum pyrenaicum, another wild native, on the roadsides and in the woods in greater quantity (though sadly not great enough to consider regular wild harvesting). This plant, unrelated to true asparagus, is also known as 'asperges sauvages' (or 'Bath Asparagus' in Britain) and one uses the stalk and flower bud spike. It can be purchased (in the very short season - perhaps only two weeks) from bigger markets, who are supplied by commercial growers. I creamed the soup using the hand held whizzy wand blender thingy, not the Mouli. Food mills are only really worth using when the air incorporated into the mix by an electric blender would change the flavour unacceptably. Tomato soup, for instance, needs to be milled by hand. 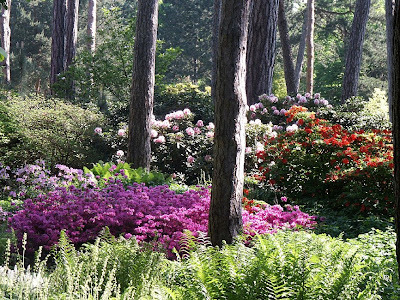 Azaleas and ferns amongst the pine trees (above). These pine trees were on the site before the Parc was created, and were wisely allowed to remain. Their tall, bare, straight trunks provide a very striking vertical note. 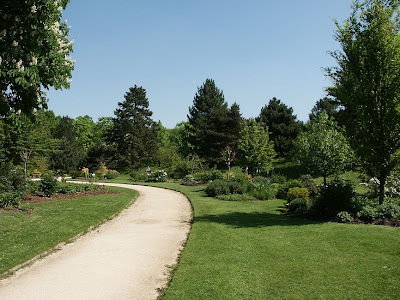 Our previous posts about the lovely Parc can be found here and here.